When drawing in a digital application, it is not like drawing on a sheet of paper, sometimes the lines you draw may look as if they were drawn with an unsteady hand. When this occurs, you may need to correct the look of your lines. Toon Boom Harmony has a very powerful tool you can use to optimize contours and reduce the number of points on the lines, the Smooth Editor tool. 1. In the Tools toolbar, select the Smooth Editor tool or select Drawing > Tools > Smooth Editor. In Harmony Paint, select Tools > Smooth Editor. 2. 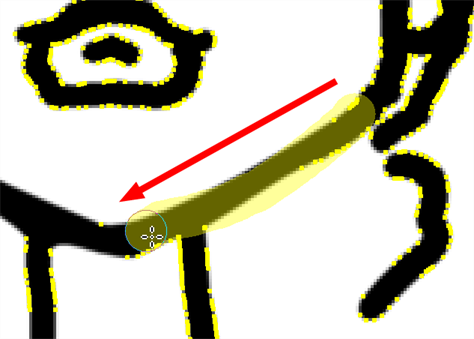 In the Camera or Drawing view, place your pointer over the lines to smooth. You may need to pass over the same line several times to remove more points and make the line smoother.